I didn't think at first that I needed this cute tool die set from My Favorite Things....but it turned out that I SOOOOO did. 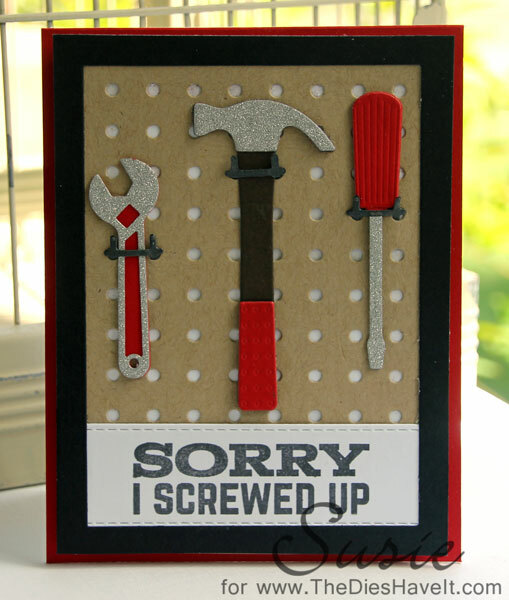 I am loving the pegboard and the tools and plan to make some more fun cards like this one. When we were at the MFT Workshop in Florida, we made a card similar to this so I wanted to do another with my spin on it. I used glitter paper for the tools where you would normally see metal. FUN! I hope you like today's card. I'll be back tomorrow to show you another brand new card.